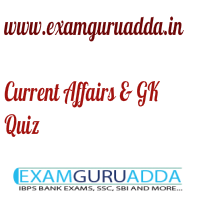 Dear Readers Examguruadda.in presents Daily Current Affairs Quiz-13-14th April 2017 that cover important current affair events. Current Affairs quiz for IBPS PO,clerk, RRB-Po,Clerk, SBI, NIACL,Railways and SSC Exams. 1. Who has won the 2017 Formula 1 Chinese Grand Prix tournament? 2. Which company has been named the official Innovation Partner for the 2017 ICC Champions Trophy 2017? 3. Kristin Davis has been appointed the new UNHCR Goodwill Ambassador. She hails from which country? 4. The Union government will launch “SAMPADA Scheme” for which sector? 5. Who is the newly appointed chairman of Telecom Disputes Settlement & Appellate Tribunal (TDSAT)? 6. Who has become the first Naga cop to receive Shaurya Chakra award since Nagaland attained statehood? 7. Which committee has been constituted by the Union government to monitor the regional air connectivity scheme “UDAN”? 8. Which state government to launch cheap food canteen “Annapurna Bhojnalayas”? 9. Which Indian-origin personality has become first non-white judge at the Old Bailey Court of London? 10. Who has won the 2017 Pulitzer Prize in fiction?